Leading political and environmental commentator on where we have gone wrong, and what to do about it " Without countervailing voices, naming and challenging power, political freedom withers and dies. Without countervailing voices, a better world can never materialise. Without countervailing voices, wells will still be dug and bridges will still be built, but only for the few. Food will still be grown, but it will not reach the mouths of the poor. New medicines will be developed, but they will be inaccessible to many of those in need. " George Monbiot is one of the most vocal, and eloquent, critics of the current consensus. "How Did We Get into this Mess?," based on his powerful journalism, assesses the state we are now in: the devastation of the natural world, the crisis of inequality, the corporate takeover of nature, our obsessions with growth and profit and the decline of the political debate over what to do. While his diagnosis of the problems in front of us is clear-sighted and reasonable, he also develops solutions to challenge the politics of fear. How do we stand up to the powerful when they seem to have all the weapons? What can we do to prepare our children for an uncertain future? Controversial, clear but always rigorously argued, "How Did We Get into this Mess?" makes a persuasive case for change in our everyday lives, our politics and economics, the ways we treat each other and the natural world." "A dazzling command of science and relentless faith in people ... I never miss reading him." "George Monbiot is always original-both in the intelligence of his opinions and the depth and rigour of his research." "His passion for social and ecological justice is undimmed by twenty-first-century cynicism. His desire for knowledge across the widest gamut of subjects (scientific, historical, political and cultural) enables him to reach places which are foreign territory to many of us." 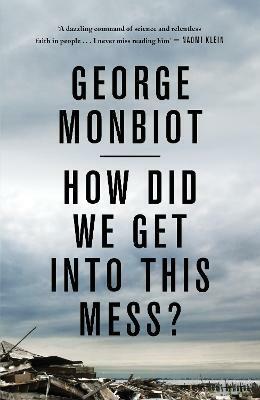 "What most impresses in Monbiot's clever, elegant writing is the way he strives to think beyond protest towards realistic, representative solutions to the problems of world politics and trade." "A writer of eloquence and passion." "An excellent critique of much that is wrong with modern society." George Monbiot writes a weekly column for the "Guardian" and is the author of a number of books, including "Heat: How to Stop the Planet Burning"; "The Age of Consent: A Manifesto for a New World Order"; "Captive State: The Corporate Takeover of Britain"; and "Feral: Rewilding the Land, Sea and Human Life." He recently helped to found Rewilding Britain, which seeks to redefine people's relationship to the living world.